By now it should come as no surprise to anyone to hear that American parents are struggling to meet the conflicting demands of their jobs and their families. As the field of work-life research has grown over the past two decades, we’ve seen hundreds of studies showing that structural changes in the American family and the way that we work have led to unprecedented work-life conflict for all of us. It’s not me, it’s us. People still think that the work-family conflict they experience is a private issue. It’s not. It is part of a larger problem, and something we need to address collectively. If we add up all of the millions of private work-family problems that American working parents face, we see that this is not millions of individual issues, but one whopping public issue. The business case is not understood. Despite years of research showing that workplace flexibility is good for business, many people still think that flexible scheduling, telecommuting and other flexible work arrangements are bad for business and cost too much. In fact, mountains of research show that flexibility, when properly designed and implemented as a strategic business tool, is good for the bottom line. It can increase engagement, a key ingredient for improving productivity; reduce absenteeism and overtime; and decrease attrition and its associated recruitment and training costs. Flexibility makes good business sense, but too often business leaders do not understand this. We don’t know how to do it. Even when company policies are in place and managers and supervisors are positively inclined, they often don’t have the knowledge and tools they need to effectively implement and manage flexible work options; they simple don’t know how to do it. Making the ask. Most employees still aren’t asking for workplace flexibility, no matter what their situation. Most often they don’t know how to frame the request in business terms, thereby decreasing their odds of getting flexibility. And in this economy, employees are often afraid that asking for flexibility will result in stigma or job threat. Knowing how to ask in business terms could go a long way — although not all the way — to addressing these fears. 1) Awareness that you are not alone. Lots of people, including working parents, as well as older workers, people with disabilities, and family members of those in the military, need workplace flexibility. Strength rests in numbers and the numbers are large, but they are now quiet. Someone once told me that what we now need is a “coming out” moment. People need to find their voices and publicly speak out about the struggles they face and the solutions they need. Moreover, businesses need to talk, too. Lots of companies are doing terrific things with flexibility. CEOs, managers and supervisors need to share their experiences and successes. All of us need to come out and talk about the challenges we face, the flexibility solutions we need, and the realistic ways that it can work. But we need a platform for making these voices heard. 2) Education about the tools that are available. There are many resources out there for helping supervisors and managers run effective work-life programs. Unfortunately, a lot of employers and employees don’t know about them. WorldatWork’s Alliance for Work-Life Progress’ National Work and Family Month tools page is a great place to start, and there are many more resources, such as the Society for Human Resources Management’s We Know Next, Families and Work Institute‘s When Work Works, and Corporate Voices for Working Families. 3) Conviction. People across the work spectrum have already begun to stand up in favor of making this change — employers, employees, managers, CEOs, CFOs and HR directors. But most of us still don’t believe that we can make this happen; we still shrug and say, “That’s the way it is.” Each of us needs the conviction to say we’re ready to make a change — in our own lives and on a larger level. 4) Action. The desire is there, the research is there, and the conviction is growing. So let’s make it happen. This week the Alfred P. Sloan Foundation announced another important step in that direction: two grants totaling more than $3.3 million. The first grant will go to the Society of Human Resource Managers, working with Families and Work Institute to build the workplace flexibility movement in all 50 states. They will produce tool kits and resources, free of charge, that will help HR practitioners, employers and employees find workplace flexibility solutions that work. Do you still think your small business couldn’t possibly function if you offered your employees flexible work hours? Do you believe your staffers need to be at their desks 9 to 5, or they couldn’t do their jobs effectively? Then you’ll want to know about a growing trend: Companies are increasingly offering even low-level or hourly workers flexibility that used to be available only to white-collar employees. The Wall Street Journal recently reported on this trend and took a look at how factory workers, retail clerks, food service employees and customer service call centers are starting to offer flexible hours to suit their employees’ schedules. Typically, hourly workers haven’t had a lot of flexibility in their work arrangements. They often find out their week’s schedule just a few days in advance, forcing them to scramble to handle child-care arrangements, doctors’ appointments or other events. One study cited in the article says nearly half of hourly workers have “little or no” control of their schedules. Why are companies making the change? It’s not entirely altruistic, of course. Offering flexibility helps reduce absenteeism and turnover among employees who can’t fit an inflexible job schedule into their other responsibilities. I think we’d all agree that having to replace a worker and train a new employee is something we’d all like to avoid, costing us time, effort and money. There’s another clear reason I see for offering hourly workers flexible arrangements: It can help alleviate resentment that builds if some of your employees are allowed flexibility or even remote work options while others are not. Inevitably, in any business there are some jobs that can be done at home (typically white-collar) while others (retail clerk, assembly line) can’t. If you can’t offer these employees the option to work at home, letting them set flexible hours to suit their needs is a nice way to make up for it. If flexible work truly doesn’t work for your hourly employees, other options that employers are using include offering short increments of paid time off. One company in the article offered as little as 15 minute segments), enabling employees to deal with doctors’ appointments or children’s school plays without having to take the full day off. 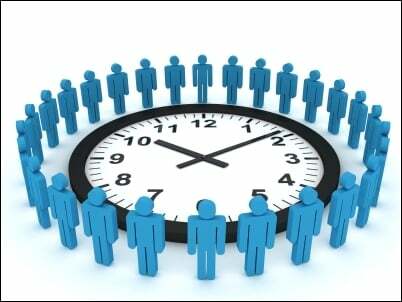 You can also offer more lead time on scheduling so employees can plan better knowing what hours they’ll be working in the coming month. Companies cited in the article say they’ve found more employee engagement, greater loyalty and almost zero turnover among employees who have the option of flexible scheduling. And as someone who offered my staff flexibility for years (even before it was in vogue), I can vouch for the same. You may not like the idea of flexibility, but the reality is that with two-income families and a 24/7 economy, your approach to how employees work needs to keep pace with the times. If it doesn’t, you’re losing loyalty, losing employees and, ultimately, losing money. Rieva Lesonsky is CEO of GrowBiz Media, a media company that helps entrepreneurs start and grow their businesses. Visit her blog, SmallBizDaily. Visit her website SmallBizTrendCast to get the scoop on business trends and sign up for Rieva’s free TrendCast reports. The decision to leave the workforce and raise a child isn’t always voluntary, especially during this recession. I personally know a handful of women, including myself, who were laid off while pregnant or on maternity leave. While all of us initially looked for full-time employment, job hunting gets tricky when you have a visible “bump” or need to breastfeed every couple of hours. As a result, many of my friends have temporarily stopped their searches and are settling into their unexpected roles as stay-at-home moms. Anytime parents stay at home with children they face the reality that reentering the workforce can be difficult. Like it or not, some employers have a bias against hiring people they feel “opted out”. Many job candidates also find their skills and networks get rusty rather quickly. Before you panic, consider a recent article in The Wall Street Journal. In Sue Shellenbarger’s Work & Family column, she tells the story of three stay-at-home moms who successfully returned to the workforce after a hiatus, despite the lousy economy. One woman’s story was particularly encouraging and offers a road map any stay-at-home parent can follow. The key to success for a former design manager was that she took on volunteer work that kept her skills sharp. She chaired a $115,000-a-year scholarship program and co-headed a 60-parent school group with a $65,000 budget. The new boss says she was attracted to the designer’s resume because the volunteer work showed she could manage a lot of complexity. So does this mean a mom shouldn’t waste her time helping out in her daughter’s classroom? Or teaching an art class at the local playground? Of course not. But it shouldn’t be the only volunteer work you do, especially in the year or two before you decide to start looking for paid work. It’s better to find something that uses your professional skills. In fact, this is often good advice even for parents who are working. In my case, I’m helping out my daughter’s preschool this Fall by giving a financial seminar based on my book, The Wall Street Journal. Financial Guidebook for New Parents. Volunteer work that utilizes some of your work-based experience also serves another purpose. It gives you an opportunity to network with other professionals in a more formal setting than a child’s birthday party. You’ll also get the chance to show off some of your job-related skills. What are you waiting for? Those companies willing to look at new staffing strategies are acquiring the best people now to take them forward. The hiring news of 2011 is simple — the economy is forcing all types of companies to reevaluate their budgets and how they hire. The old way of hiring doesn’t work anymore. Only our non-traditional staffing gives companies the freedom and flexibility to stay competitive in all economic climates. We call it Recovery Hiring and it’s the new normal. SMALL BUSINESS SUCCESS STORY - A small technology company based in Stamford, CT was seeking a professional to work on documentation, customer management and QA. We placed the perfect candidate, a woman looking to work full-time where she controlled her schedule. Both got exactly that they want — the company got a person with all the skills and experience they needed and within budget, and our candidate gets to work her own hours, both in the office and from home. MID-SIZED BUSINESS SUCCESS STORY — A renewable energy company based in Westchester County came to us recently seeking a high-level financial analyst with an investment banking background, willing to work 15 hours a week. We made the perfect match and our candidate is now working in a job where she is immediately adding value and is in a position to grow along with the company. BIG BUSINESS SUCCESS STORY - A major international hospitality chain based in Westchester was seeking a high-level marketing consultant who could hit the ground running from Day One with little or no learning curve. A four-day workweek fit perfectly with their limited budget and expanded our pool of available talent. A Wall Street firm is seeking a high-level business manager who can work with a diverse, multi-cultural staff of professionals 24 hours a week. Workplace flexibility is not just about moms anymore. It’s about best business practices that improve productivity, leading to an improved bottom line. It allows all employees the freedom to control their times and meet deadlines. Flexibility creates a workplace culture that allows the best workers to put their best foot forward — only the top producers thrive in this culture. Many managers worry that flexibility creates an slacker atmosphere but in fact just the opposite is true. Only those professionals who respect deadlines and are motivated to meet goals appreciate a flexible workplace that allows them the freedom to control their time and work when and wherever necessary. The end of the helicopter mom? STAMFORD, CT, April 12, 2011 — Unlike the previous two generations of working mom executives - first the Baby Boomers, who blazed the trail in the workplace for work-family balance, then Gen Xers, who often put careers on hold while raising young children, Gen Y women are different - they aren’t even considering slowing down or not working as they are now experiencing motherhood for the first time. Being a fairly driven group, many of these women are telling us that they fear ‘losing their edge’ - that the workplace will not want them if they step off the career track for any length of time. “They tend to be very driven young women,” says Nadine Mockler, who, along with her partner Laurie Young, founded Flexible Resources Inc., 23 years ago to help Baby Boomer moms like themselves find a way to balance career and family, and often faced a work environment hostile to their needs. Their company was a direct outgrowth of their inability to secure flexible work for themselves. Flexible Resources is a staffing and consulting firm that specializes in creating all types of non-traditional work arrangements at the professional level. They work with small and large companies to structure work arrangements that enable companies to staff effectively and efficiently using flexible work arrangements. CONTACT: Joyce Fredo, Redbird Communications, 203-968-0786; jgfredo@optonline.net. Flexible workplace innovator, Flexible Resources, Inc. shows companies no-cost options for a creating greener, cleaner company while boosting productivity. STAMFORD, CT, April 6, 2011 — Earth Day is Friday, April 22, and it begs the question: what can businesses do for the environment beyond recycling paper and printer cartridges? There’s nothing more effective, more comprehensive, more completely carbon-neutral than initiating a program of flexible work arrangements that features telecommuting. It not only can turn a business green overnight, it creates a more productive and profitable workplace with employees who are focused, motivated, and committed. Telecommuting, whether in full- or part-time positions, means employees work remotely - from anywhere, anytime. “It’s the most effective option for reducing greenhouse gases, fuel consumption, and has the power to virtually eliminate the bane of every commuter - rush hours. It’s also the only workplace model in step with technology and a global workforce that functions 24/7,” according to Flexible Resources co-founder Nadine Mocker. Other types of flexible work arrangements, such as part-time and staggered work hours, keep employees off the road at peak hours. Flexible staffing also allows companies to keep office space and resource consumption at a minimum. Did you know that 60 percent of working moms wish they could work only part-time, but only about a quarter actually do? That’s from a Pew Research Center study in 2007. And it means that well more than a third of all working mothers are at least somewhat dissatisfied with their work situation. That makes for a huge number, given that the Bureau of Labor Statistics reports that about three-quarters of all women ages 25-54 are in the labor force. So why don’t more working moms go for part-time work? It’s just not that easy to find good part-time jobs. Young says when she and business partner Nadine Mockler first started Flexible Resources 23 years ago, they thought it would be a “mommy company” placing former stay-at-home moms with professional experience in challenging part-time positions. Since then, their candidate pool has expanded to include retirees, former full-timers who want to ratchet back, authors who need to earn some money while writing, and even actors. Young believes that while she still has to convince some companies that part-time is a win-win for everyone, more businesses will eventually come around to accepting part-time options for their employees. STAMFORD, CT, March 20, 2011 — No benefits, sick pay, vacation, 401ks, — so what’s the attraction? “A recent study states that 80% of businesses say they will continue to use and/or grow their use of contract employees for 2011,” says Nadine Mockler, co-owner of Flexible Resources, Inc., a staffing and consulting firm that specializes in creating flexible staffing solutions for professionals. But how do you attract quality talent under these circumstances? How do you evaluate - and most especially motivate — professionals who know they won’t be there for the long-term? “The worst way to do it is to hire temps — people looking for full-time positions who are temping until they find a permanent position,” says Mockler’s partner Laurie Young. “They will leave the minute a permanent position opens up. “Businesses that are committed to attracting big-ticket talent on a contract basis need to look at entirely different group of job-seekers - one that is seeking a flexible work arrangement for the long-term. It is only this type of employee who won’t leave for full-time, and who will be committed and loyal to a company that allows them the flexible work arrangement that they consider essential to their lives. “Businesses are now hiring temps or contract workers to do what permanent staff used to do-so companies need to be attractive to top-tier professionals and to make sure they will stay as long as they are needed. And the most effective way to do that is to not ignore those professionals who seek options to telecommute, work a contracted week, part-time, or staggered hours. “That’s the New Deal of business if the “just in time” hiring work is going to work: if the employer won’t commit to a permanent position and the usual perks that go with it, then they must cater to the contract worker who is seeking flexibility as a lifestyle solution,” says Mockler. Flexible work is the new motivator of the new non-permanent workforce,” says Young. BEST CHANCE OF FINDING WORK? Flexible Resources, a staffing and consulting firm that specializes in placing professionals in flexible work arrangements, has been busy over the past year working with companies that have suffered layoffs and hiring freezes.